Ghee is the most prized source of dietary fat in Ayurveda, due to its ability to support digestion without increasing heat in the body. It is also nourishing for both the nervous system and brain. 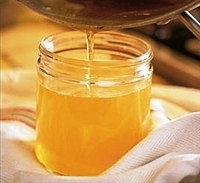 Ghee is a good source of vitamins A, E and K2, as well as CLA (Conjugated Linoleic Acid). Ghee is an excellent cooking oil as it does not oxidise at high temperatures and create free-radicals, as most vegetable oils tend to do. If you can get it, butter from grass-fed cows supplies the right balance for brain development and balance of omega-3 and omega-6 fatty acids. Melt 1 pack of organic unsalted butter in a heavy bottomed pan. Turn down the heat until the butter just boils, stirring occasionally. After 12-15 minutes it will begin to smell like popcorn and turn golden. At the same time, whitish curds will form in the bottom of the pan. There will also be a reduction in the noise it makes: This is when you have to start to watch it carefully! When the curds on the bottom have turned a light brown colour take the pan off the heat immediately and cool slightly before straining the ghee through a fine sieve into a glass jar. 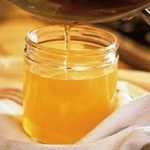 Ghee does not need to be kept in the fridge, but keep a lid on and be careful not to allow any water to get into the jar as this will cause it to spoil.